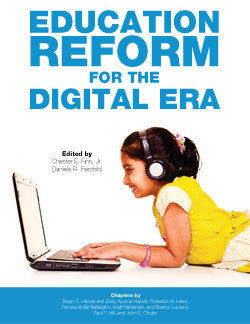 In Fordham’s new book Education Reform for the Digital Era, Bryan C. Hassel and Emily Ayscue Hassel’s opening chapter proposes that “digital education needs excellent teachers and that a first-rate teaching profession needs digital education.” In the digital future, teacher effectiveness will matter even more than it does today. While the roles of teachers and other adults will change dramatically, what will increasingly differentiate outcomes for schools, states, and nations is how well responsible adults carry out the more complex instructional tasks. At the same time, technology has enormous transformative potential to extend the reach of excellent teachers to vastly more students, to help teaching attract and retain the best, and to boost the effectiveness of average teachers. To realize that promise, though, the nation needs new staffing models, significant policy changes, and a stronger dose of political will to change. Read the chapter here, and watch Bryan Hassel on a webcast of the release event here. The authors also penned a related commentary that appears here.